Baku blends rustic and exotic style, with dowel detailing, matte black drop-bar handles and stud work, chunky-cut wood and smoothly chamfered edges. The Baku Light collection is just one of our extensive ranges of natural solid mango furniture. The Baku Range is designed to be both rustic and exotic, and features dowel detailing, matte black drop-bar handles and studwork, chunky cut wood and smoothly chamfered edges. As with all of our ranges, each piece within this range is designed to match and complement the other pieces within the range. 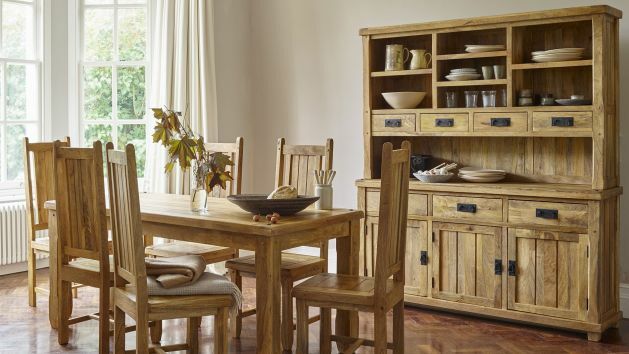 The light, natural mango grain finish is consistent across all of our natural mango furniture ranges. The Baku Light range is made by skilled craftsmen who create traditionally hardy features such as crafted dovetail joints in every drawer. The mango hardwood is finished in nothing but a natural furniture wax, which protects the wood from wear and tear as well as enhancing the natural beauty of the mango grain. The Baku Light collection includes pieces to suit any room in the whole home, from beds and wardrobes for the bedroom, to fantastic dining sets and dressers for your dining space. We provide various finance options for customers who wish to buy now and spread the payments.